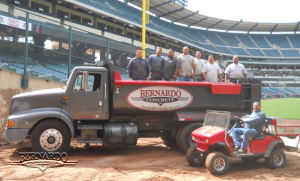 Concrete Contractors – Concrete Contractors, Concrete Construction, Concrete Paving | Bernardo Concrete Inc. There are many different jobs that might need the right concrete contractors. Among the issues that could use a concrete repair specialist are problems with the foundation in your home or business. Knowing a little about some of these issues can make a difference where getting the right help is concerned. Over the lifetime of any concrete structure, there are several problems that can arise and concretes strength is only one of the issues you might need to look after. There are other problems that need the expert touch of a concrete repair specialist and these include the presence of excessive moisture and the soil composition of the surrounding area. It’s necessary to make sure the concrete contractors you’re looking at are familiar with these issues. It’s necessary to keep in mind that the quality of the concrete foundation is quite often dependent on how the concrete is poured. If the job is not done right straightaway, there can be issues almost immediately and that’s why the concrete repair specialist you’re looking at needs to be aware of all the circumstances that can be involved. Its also a good idea to make sure any concrete contractors you’re considering know all about how climatic conditions can affect the quality of the finished product. For example, where the temperatures in winter actually dip below a certain point, it’s possible a concrete foundation that has just been poured can actually freeze over. Here it’s necessary for concrete contractors to test for strength before they decide on any course of action. Quite often this will mean a hole needs to be drilled down into the concrete and a test piece sent away to determine the samples strength. If there’s a concrete repair job needed, it’s good to know the proper procedures have been implemented by professional concrete contractors first. A well trained expert will know who to contact in the event the strength of the concrete is in question, and if the concrete contractor doesn’t know who to contact, they should know a structural engineer who can point them in the right direction. Getting the right concrete contractors on the job is often about knowing a little about any potential problems yourself. That way you stand a better chance of getting a proper concrete repair job done. Do you ever think your driveway needs remodeling or a slab of concrete needs repairing but don’t know exactly what concrete company is right for the job? Well you should definitely consider Bernardo Concrete for any concrete slab or concrete repair project you might possibly need done. Here at B.C.I we take pride in the work we do. Now you might be thinking it’s just a simple 4″ thick piece of concrete how hard could it be to construct that? For concrete contractors like us, or anyone in the construction business we know how much hard work and skill goes into a simple project like removing and replacing a concrete slab; or even a more technical project like installing concrete handicapped ramps. Bernardo Concrete has had over twenty years of knowledge and experience in the construction business and continues to grow and learn along the way. Below is a video featuring a limited amount of the technique and skills we offer as a concrete contractor. With all of our knowledge and experience we can assure that we know what needs to be done in order to succeed at any concrete construction project we take on. As concrete contractors in Southern California we understand and are aware of all the requirements that need to be met before, during, and after any concrete construction project is completed. We make sure we are up to date with all the laws and local city codes pertaining to your city. We’re always here to assist you with any concrete construction needs you have.